Abstract: Where did the journal come from? Why is it here? And that all-important question, where is it going next? In the words of the King of Pop himself, ‘every day create your history, every path you take you’re leaving your legacy’. In this episode we talk about the past, the present and the future of The Journal of Michael Jackson Academic Studies online. Merx, Karin, and Elizabeth Amisu. 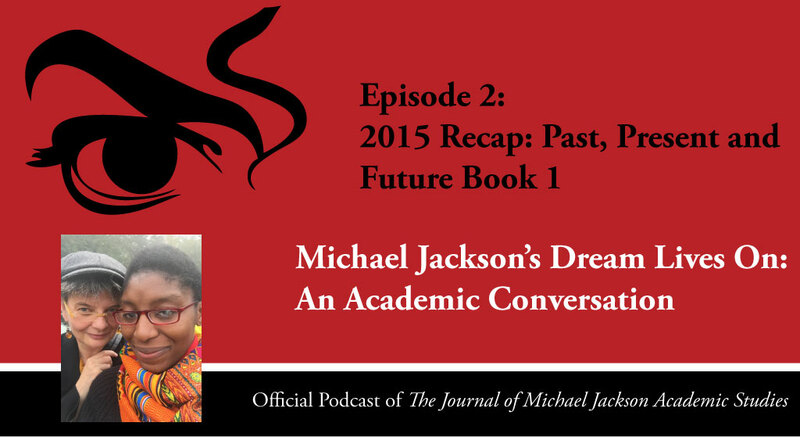 “Episode 2 – 2015 Recap: Past, Present and Future Book 1.” Podcast, Michael Jackson’s Dream Lives On: An Academic Conversation 2, no. 1 (2016). Published electronically 7/01/16. http://michaeljacksonstudies.org/the-dream-lives-on-2-past-present-and-future/. ‘It was in 2014 and we met on Twitter and decided that there needed to be one place where we could start to collect everything that had been written on Michael Jackson’s art, specifically his body of work and I remember we started this website and we started collecting articles like crazy.’ – Karin Merx. 1. The first publication on The Journal of Michael Jackson Academic Studies was ‘Throwing Stones To Hide Your Hands’: The Mortal Persona Of Michael Jackson‘ by Elizabeth Amisu. It was published on June 17th 2014, and since then the article has been read thousands of times and translated into other languages (see Footnote 2). It has also become the cornerstone chapter of an academic book called The Dangerous Philosophies of Michael Jackson: His Music, His Persona, and His Artistic Afterlife (Praeger, 2016). 2. Amisu, Elizabeth. “‘Arrojar Piedras Y Esconder Las Manos’: La Personalidad Humana De Michael Jackson.” [In Spanish]. The Journal of Michael Jackson Academic Studies 1, no. 3 (2015): 3. ———. “‘Lanciare Sassi e Poi Nascondere le Mani’: La Natura Umana Di Michael Jackson.” [In Italian]. The Journal of Michael Jackson Academic Studies 1, no. 3 (2015): 4. ———. “‘Throwing Stones to Hide Your Hands’: The Mortal Persona of Michael Jackson.” In A Companion to Michael Jackson Academic Studies I, edited by Elizabeth Amisu, 11: MJAS, 2015. 3. Watch out for Elizabeth in this video for her MA at King’s College London – MA Early Modern English Literature: Text and Transmission. 4. Dr. Joseph Vogel’s pioneering MJ Studies page that inspired us to create this journal. 5. Joseph Vogel, Man in the Music: The Creative Life and Work of Michael Jackson. Sterling, 2011. 6. Check out our wonderful contributors, who have donated articles and essays. 7. The Journal of Michael Jackson Academic Studies | ISSN: 2452-0497. 8. What is an ISSN anyway? 9. A Companion to Michael Jackson Academic Studies I This first ever academic companion to Michael Jackson’s art is an indispensable tool for academics. 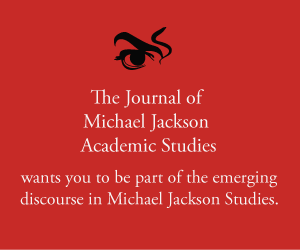 Worth £25, it is available COMPLETELY FREE to subscribers to The Journal of Michael Jackson Academic Studies. 10. Translations of MJAS articles in Italian, Spanish, and German. 11. Susan Fast, ‘Chapter 4 – Difference That Exceeded Understanding: Remembering Michael Jackson(Redux)’ In Death and the Rock Star (Ashgate, 2016), 45-60. 12. Joseph Vogel, ““I Ain’t Scared of No Sheets”: Re-Screening Black Masculinity in Michael Jackson’s Black or White.” Journal of Popular Music Studies 27, no. 1 (2015): 90-123.